My four year old daughter loves to watch me cook and bake in the kitchen and she has been asking recently if she can help too. I admit that I have been reluctant to let her “assist” me because I didn’t want to have the extra mess to clean up afterwards and felt like she would just slow things down. I decided that it was time to surprise Hannah and let her help me bake an apple cake when I discovered that my favorite apron designer, Flirty Aprons has a new line of aprons for the entire family, including children. My daughter was beaming with pride when I presented her with her first “Frosted Cupcake” apron and invited her to help me in the kitchen. In the end, I was the one who was surprised because there was no extra mess and in fact she was very helpful! It was such a fun bonding experience and I think my boys were just a tad bit jealous of our “girl time” as mom and daughter proudly baked in our matching aprons from Flirty Aprons. The children’s aprons are made of the same high quality fabric that Flirty Aprons is well known for and these pint-sized aprons are just adorable. 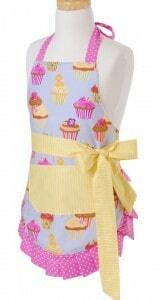 Designed for children ages 3-7, the apron is made of 100% cotton and has a solid white liner. The aprons are not only functional but super stylish and comfortable. With the “Frosted Cupcake” apron, I love the vivid pastel colors, unique patterns and tasty looking “cupcakes” that adorn it. Flirty Aprons has a full line of family friendly aprons. My husband enjoys grilling and I think he would love the fun, manly “My Grill is Hotter Than Yours” apron in black. It would make a great gift idea for the holidays for your favorite chef. Don’t forget to check out all of the colorful, flirty styles for women too…….there are lots of fabulous aprons to choose from in the collection. You are invited to Visit Flirty Aprons to browse the entire selection or to purchase your favorites. Connect with Flirty Aprons on Facebook . Book Review | How Do Dinosaurs Say Happy Birthday?